Too many people determine how long they think they’ll live based on arbitrary factors. And nearly half of pre-retirees and retirees underestimate how long they’ll live by five years or more, according to surveys by the Society of Actuaries. That’s a big problem when it comes to making sure your money lasts as long as you do. And very few people surveyed understand how variable life expectancy can be: Whatever the statistics say is the average life span for someone of your age and gender, you have a 50% chance of living longer than that age. In other words, planning for living to an “average life expectancy” is a recipe for disaster! By age 65, men in average health have a 40% chance of living to age 85, and women have more than a 50% chance. And if you’re healthier than average, well now you’ve got a 50% chance of living to age 85 if you’re a man, and a 62% chance if you’re a woman. Of those turning 65 today, 25% will live past 90, and one out of 10 will live past 95, according to the Social Security Administration. What if you’re the lucky one who hangs on until 100 or longer? You don’t know for sure, do you? But just how “lucky” will you feel if you can’t provide for yourself in those final years? My 95-year-old mother-in-law lives in an assisted-living facility in Arizona. When her husband died, she got a life insurance settlement and has been receiving a nice pension payout every year. And, she is one person I never suspected would run out of money before she ran out of life. But that’s exactly what’s happening. She lives a frugal lifestyle, but the assisted-living facility raises the rent every year, and it’s more than the increases she gets from her pension and Social Security. We figure her living expenses will exceed her income within a year or two, and we’ll pitch in to help at that point. She’s still going strong and could easily live another decade. Here’s another factor. Do you consider yourself to be well-educated? If so, you’ll likely live longer than average, too. Most people surveyed say their first line of defense is to reduce their expenditures significantly. You work hard all your life, and now your “golden years” are marked by scrimping and sacrificing just to get by. Almost as many people said they would return to work or work more hours than they currently do, if they find themselves running out of money. That’s a lot easier said than done. Nearly half of retirees were forced to leave the workplace earlier than planned, due to health problems, disability, or having to take care of a loved one, according to the Employee Benefits Research Institute. A lot of folks have their heads in the sand. They hope if they ignore the problem, somehow it will go away. It won’t. And the longer you wait to get serious about it, the harder it’s going to be and the more hopeless you’ll feel. Doesn’t it make sense to plan for your money to last for as long as you might live? How confident are you that, if you continue to save and invest the way you’ve been doing it, your money will last until you’re 90, 100, or even 110 years young? In the past, we were told we could withdraw 4% of our savings every year. But increased lifespans and persistent low interest rates have led experts to calculate that retirees should withdraw only 2.8% of their retirement savings each year. Anything more than that significantly increases your chances of running out of money in retirement. Saving for retirement through a combination of super-charged dividend-paying whole life insurance and the right kind of annuities can give you the peace of mind and security of knowing your money will last as long as you do. Has a proven track record of success over the last two centuries! No two plans are alike. 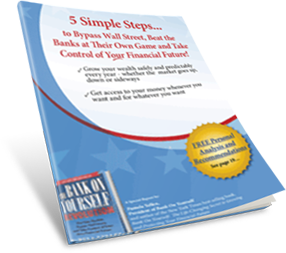 Yours would be custom tailored to your unique situation to help you reach your financial goals and dreams, in the shortest time possible, without taking any unnecessary risks. It’s easy to find out what your guaranteed numbers and results could be when you request a free, no-obligation Analysis here. It’s not too late to get your retirement plan on track for success – regardless of how long you live, or what happens in the stock market.